Centro Comercial Santafé is the largest shopping mall in Medellín with over 2.1 million square feet of space. The mall opened in May 2010. Santafé is located in El Poblado along Avenida Poblado just south down the road from the Oviedo mall. The huge mall was built to target the higher incomes found in El Poblado. When the large Santafé mall was built it started to take some business from nearby Oviedo, which was built in 1979. Even after some upgrades to Oviedo in 2003, it has begun showing its age, with some vacancies beginning to appear. Santafé has a retractable roof that the mall operator opens when the weather is nice, which is pretty often. Santafé also frequently decorates during holidays and other events. During this year’s Feria de las Flores, the mall set up a floor display with over 150,000 flowers. The anchor tenants of Santafé are Divercity, Falabella, Jumbo and Cine Colombia. Santafé has over 380 shops, which include stores selling clothes, shoes, home furnishings, mattresses, eye-care and several other categories. Falabella is a large department store that sells a wide range of items including clothing, furniture, electronics and appliances, computers and sports equipment. Falabella is based in Chile and has over 70 department stores located in Argentina, Chile, Colombia and Peru. In Medellín, Falabella has two stores located in the Santafé and San Diego malls. You can sometimes find good prices on computers in Falabella. I purchased an iMac in the San Diego Falabella earlier this year for less than the cost listed on Apple’s website at the time. The iMac was on sale and I understand taxes and import duties don’t apply to computers in Colombia. The first Divercity opened in Bogotá in 2006 and the Medellín location opened when the Santafé mall opened in 2010. The company also has a location in Barranquilla. Jumbo is a large supermarket that also sells electronics, clothes, kitchen items and home furnishings similar to a Walmart in the United States. Jumbo has five stores in Medellín located in the Premium Plaza and Santafé malls as well as La 65, Envigado and Rionegro. Foreigners that have been in Colombia for a while are aware that Jumbo used to be named Carrefour. France-based Carrefour sold its stores in Colombia to Chile-based Cencosud in 2012. Cencosud uses the Jumbo brand for its network of hypermarkets that besides Colombia can also be found in Argentina, Chile and Peru. Cine Colombia in Santafé is a movie theater with six screens located on the fifth floor of the mall. Cine Colombia shows movies in Spanish as well as some in English with Spanish subtitles. Cine Colombia is Colombia’s largest movie theater chain in Colombia with theaters in 11 cities. In Medellín, it has five locations located in Los Molinos, Oviedo, Santa Fé, Unicentro and Vizcaya. Santafé has hundreds of other stores to choose from in its five floors. One unique store you will only find in Santafé is Victoria’s Secret – the only store found in Medellín. Victoria’s Secret in Colombia has three stores – two located in Bogotá and one in Medellín. The Victoria’s Secret stores in Colombia primarily sell fragrances, body care, makeup and bags. Unlike stores in the United States, Victoria’s Secret in Colombia doesn’t sell much lingerie. Victoria’s Secret products are popular with Colombian women, but many of their products are not available for purchase in stores here and must be ordered over the Internet. The main food court in Santafé is located on the fourth floor. It has over 40 fast food places and restaurants. In Santafé you will find several of the typical fast food places in Medellín including Asia Wok, Burger King, Dogger, El Corral, Frisby, KFC, Kokoriko, McDonalds, Qbano, and Subway. You will also find several restaurants, including Crepes & Waffles, J&C Delicias, Sarku Japan and Sushi Light. For the city’s best cupcakes, Dave recommends O-Cake American Bakery. Pro’s – It’s the largest mall in Medellín with a Jumbo for groceries, a six-screen Cine Colombia movie theater, a large Falabella department store, a convenient food court and more shops than you will find in other malls. It is also located in El Poblado, which is convenient to where many foreigners are located. Con’s – Since Santafé is located in ritzy El Poblado, the prices in many of the shops can be higher than found in malls in other neighborhoods. If you are looking for the best prices, Santafé is not the place to be. My Verdict – As the largest mall in Medellín it is definitely worth a trip. 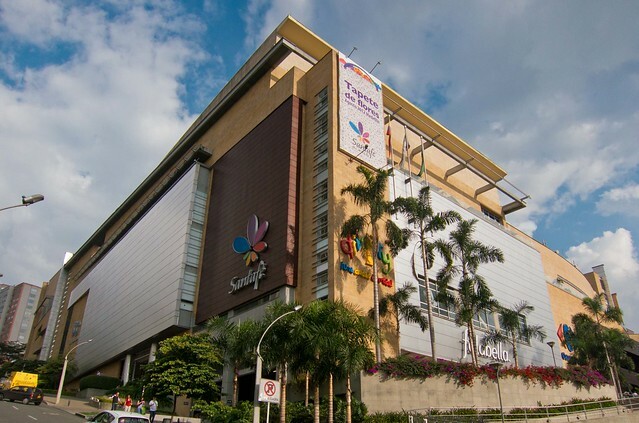 Due to its location and size it is the most popular mall in Medellín. How to Get There – It is located on the main part of Avenida El Poblado aka Milla de Oro (Golden Mile). Every taxi driver knows where it is. The nearest Metro station is Aguacatala, but this is a pretty good hike from the mall. Thanks for the review of Santafé, which is my favorite mall in Medellín. Thanks for this! I just arrived in Medellin a few days ago, and I like the way your articles explain everything.